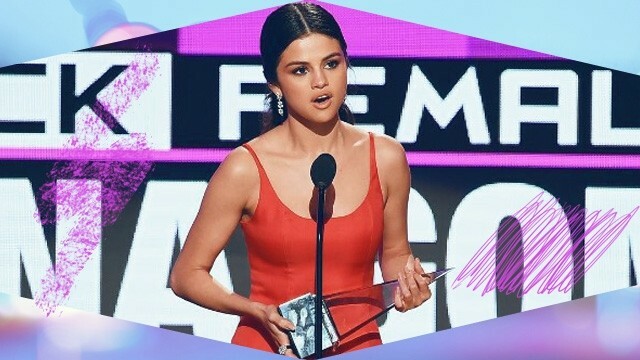 After being on hiatus, Selena Gomez stepped back into the spotlight to receive her award for Favorite Female Pop/Rock Artist at the American Music Awards. And as much as her comeback was jaw-dropping (girl slayed the red carpet! ), it was also heartfelt and powerful, especially when she delivered her acceptance speech. Below are the lessons we learned from what Sel had to say. The importance of knowing when to take a break. "I think it's safe to say that most of you know a lot of my life whether I liked it or not and I had to stop because I had everything and I was absolutely broken inside." Despite her status and success, Selena wasn't afraid to admit that there were things that were far beyond her reach. Not needing validation from other people. "I kept it all together enough to where I would never let you down but I kept it too much together to where I let myself down," she said. Despite her inner battles, Selena still tried to live up to other people's expectations, even if it was already hurting her. Until she grew tired of dealing with it or realized it wasn't worth all the trouble or both. Instead, she made a conscious effort to not look for validation or have the need to do so in the future. Being grateful for the things that come your way. "All I can say from the bottom of my heart is I am so grateful that I have the opportunity to be able to share what I love every single day with people that I love," she said before thanking her fans for their loyalty and support. Just like Selena, it's important to see the good in everything, no matter how bad the situation is. Watch Selena's heartfelt AMA speech below. Needless to say, Selena's speech was well-applauded, not only by her fans, but by fellow musicians as well. According to enewsonline.com, Lady Gaga was moved to tears while Hailee Steinfeld gave Selena a warm embrace as she walked off the stage. Niall Horan also gave his rumored ex a hug and told her, "You did so good!" while coming from backstage and on his way back to his seat. Even Ariana Grande stopped by Sel's seat and also expressed something before blowing her a kiss. Meanwhile, BFF Taylor Swift was freaking out over Selena's win as seen in her Instagram Story and "Bad Blood" music video co-star Martha Hunt tweeted, "@selenagomez just gave an incredibly moving speech." Now if that's not a good enough support system, then we don't know what else is.